Those of us lucky enough to live with an easy commute of Borough Market go there as often as we can. Inevitably, this means taking meals in the area from time to time, but until now that has been a real problem: for such a foodie Mecca it's an astonishingly barren area for decent quality restaurants. Roast is, at best, hit and miss; Fish! does was it says on the tin, usually competently but without flair; Brindisa's tapas bar is underwhelming, expensive and overcrowded. Wrights is the honourable exception, and if you like oysters you're certainly in good shape, but it has always felt like an evening venue to me. For lunch, your best bet has been to graze around the market (no bad thing if you can stand the queues) and/or enjoy the hospitality of one of the excellent local boozers. For interesting beer that probably means The Rake, for a decent freshly made sandwich The Wheatsheaf is the obvious choice. It's all change, now, though, with the arrival of Magdalen on Tooley Street. An Anchor & Hope style menu in a smart restaurant where you can actually book a table? Sounds like my perfect restaurant. And you know what, it's not far off being just that. Magdalen is a simple, elegant, welcoming space. New arrivals, certainly when the place isn't too busy, can relax and wait for the rest of their party in an informal reception by the bar before heading through to the main dining area towards the back. This split geography (without the armchairs but with a surprisingly elaborate chandelier) is mirrored upstairs. In this way a restaurant with what must be close to 100 covers feels intimate and warm throughout. The menu changes sitting by sitting - as menus really should - and for lunch last Saturday offered us a manageable choice of six starters, six mains and six puds. To start, there was a heavy leaning around the table towards the pork and rabbit terrine, a pleasing slab served (properly) at room temperature and with a dollop of damson "cheese" (basically jam but none the worse for that). 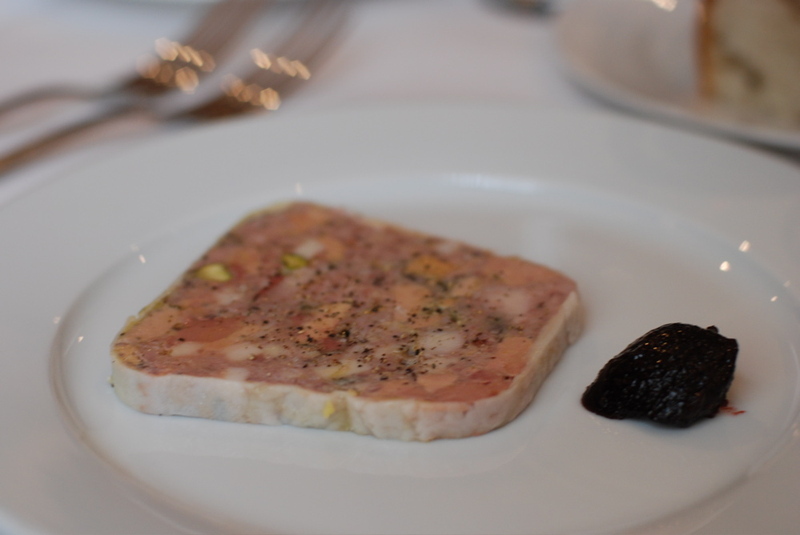 The terrine was well conceived, the tastes of the individual meats coming through well, while texture and richness were bolstered by unadvertised (but welcome) pistachios and foie gras. Lovely. My cuttlefish, chickpea and gremolata combo was every bit as good. I could imagine the inky blackness of the sauce putting some people off, but a single bite should be enough to banish all squeamishness. Rich, deep fishiness was offset by the freshness of the camouflaged gremolata and the crunchy lightness of the pulses. Another winner. 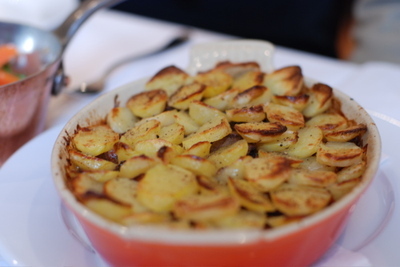 We managed just two of the mains between the five of us, I'm afraid, such was the draw of the Longhorn beef parmentier, one of two sharing dishes on the menu. This was great: slow cooked, unctuous meat with a real depth of flavour topped off with some jaunty spuds with just enough crunch. To accompany, some gutsy buttered carrots served directly from a smart copper pan. 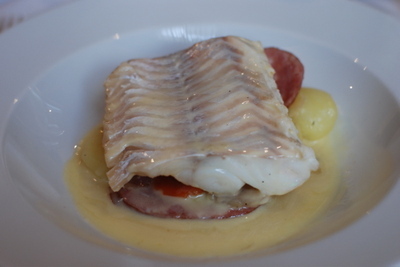 Howard confessed to food envy when he saw the rest of us slobbering over our parmentiers, but he was secretly delighted when he began to tuck into his smoked haddock with choucroute, morteau sausage and butter sauce. Like the beef, this proved to be comfort food of the highest quality. To finish, a bit more diversity: some gingerbread ice cream (subtly spicy but satisfying), rhubarb and custard (sophisticatedly presented to maximise the contrasting colours) and a glass of tasty blood orange jelly topped with a layer of unthickened cream that slipped obligingly into the gaps left by the excavating spoons. All jolly simple and very well judged after a couple of undeniably hearty courses. In short, a fabulous lunch, and at £50 a head, including a bloody Mary or two, a premier cru Burgundy, a carafe of Barbera, a glass of Sauvignon Blanc, loads of bottled water, coffees all round and service (happily not slapped on as standard) this felt like - and was - exceptional value. Everyone there will, I'm sure, be back. In my case to warm up for the Six Nations on Saturday. And indeed have now been, and liked it. I've updated the link above with my writeup. how often do you see young children (primary school age) dining at the kind of places you eat out at? In Greece, we always have our children with us when we go out for a meal, but the places aren't exactly in the fine dining category.